The International Sol-Gel Society is now soliciting for applicants to host the 21th biannual conference in Sol-Gel Science and Technology to be held in 2021. The Conference is the official International Sol-Gel Society meeting and builds on the long and successful series of biannual conferences, which started 1981 in Padova. The conference has since then been held in several Countries all over the World. 1981 – Padova, Italy; 1983 – Wurtzburg, Germany; 1985 – Montpellier, France; 1987 -Kyoto, Japan; 1989 – Rio de Janeiro, Brazil; 1991 – Sevilla, Spain; 1993 – Paris, France; 1995 – Faro, Portugal; 1997 – Sheffield, England; 1999 – Yokohama, Japan; 2001 – Padova, Italy; 2003 – Sydney, Australia; 2005 – Los Angeles, United States; 2007 – Montpellier, France; 2009 – Porto de Galinhas, Brazil; 2011 – Hangzhou, China; 2013 – Madrid, Spain; 2015 – Kyoto, Japan; 2017 – Liége, Belgium. The Official International Sol-Gel Conference of ISGS. The Sol-Gel Conference is an international gathering of the Sol-Gel Community which takes place every two years. The Sol-Gel Conference is organized jointly by the ISGS (represented by the Board) and by a Local Organizing Committee (LOC). The LOC is selected with the contribution of a dedicated Selection Committee. The Program of the ISGS Conference combines plenary sessions, key-note speakers, oral and pôster presentations in 2-3 parallel sessions. Take a look a the program expected at the St Petersbutrg Conference (https://solgel2019.itmo.ru/program) for instance. An integrated industrial exhibition shall take place on the conference site to promote exchanges between industrial and scientific people. The Conference theme and its sub-themes are approved by the Board on the basis of the proposal of the Scientific Committee on the initiative of local groups seeking to organize the Conference. Organization relies on a Chart which state the main specificities of the Sol-Gel Conference and conditions to use the label ISGS. The ISGS Chart specifies the unchangeable detailed process and the financial agreements between ISGS and the LOC. The Chart can be adjusted marginally for some aspects to the event in common agreement with the Board Member in charge of the Conference. Within this framework, the LOC has leeway to organize the conference and to leave its own mark on the event. The submission should be made electronically, sent by e-mail to: sjlribeiro@gmail.com, as a pdf, MS-word or power-point file, at the latest on March 29th 2019. – The main scientific characteristics of the project (title, head topics, main topics…). – The main logistical characteristics of the project (expected number of participants, period, location, Conference site, poster room, exhibition area…). – A presentation of attractions, assets of the country/town/site and some considerations about the venue and its ease. – A presentation of the benefits for ISGS community coming with this Conference. 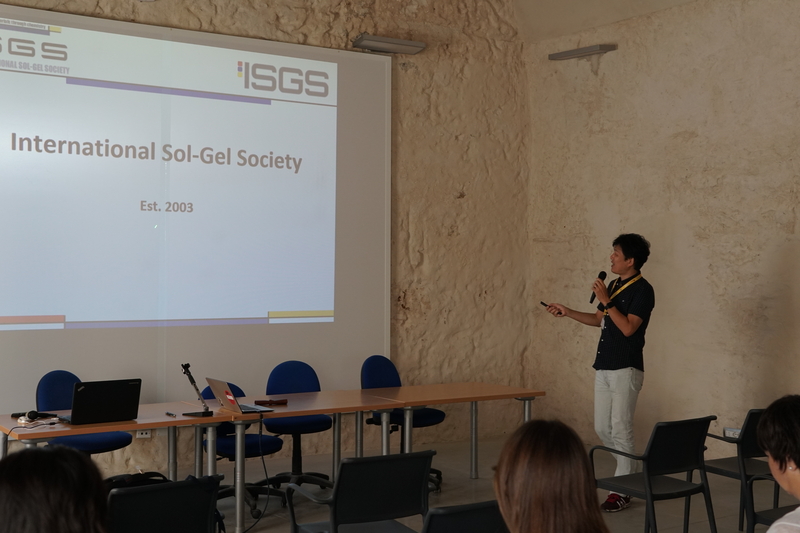 – The composition of the local scientific and organizing committees (at least 2 members have to be ISGS members recognized by the sol-gel community). – A detailed and realistic provisional budget. – It is advisable to produce documents that must ensure that LOC have the financial resources needed in particular through the support of the Government, public institutions, universities, sponsors etc… Such a guarantee will facilitate the Board’s decision on the venue of the Sol-Gel Conference. The agreement to the ISGS Charter for Local Conference Organizer is compulsory. Some of the criteria considered by the Selection Committee are listed below. Scientific excellence and scientific reputation in the field of sol-gel science and technology. -Hotel capacity/prices, spread of price categories of hotel. -Travel to location price/time etc. -A geographical spread based on previous locations is desired. -New locations are desired, and preferably the location should shift around the world. For the 2021 edition ISGS Board encourages proposals coming from outside Europe since the 2017 edition was held in Belgium and the 2019 will be held in Russia. The main goal for this related to alternating different continents in the organization. -Possible (local) strengthening of the Sol-Gel Society. -Contents and coverage of the program. -Sponsors and other financial support. -It is desired that the conference price is not increased or only slightly increased beyond that of previous meetings. -Reduced fees, cheap but respectable housing, participation in all activities, etc. 1-The Selection Committee ranks the applications and selects an applying LOC for approval of the board of the ISGS. 2-The ISGS Board sends its comments to the Selection Committee, which sends back the final proposal. 3-Ratification by the ISGS Board and signing of the ISGS Charter. The announcement will be made at the ISGS web site in July, 2019 and the presentation will be made at the 2019 Conference in St Pertersburg.